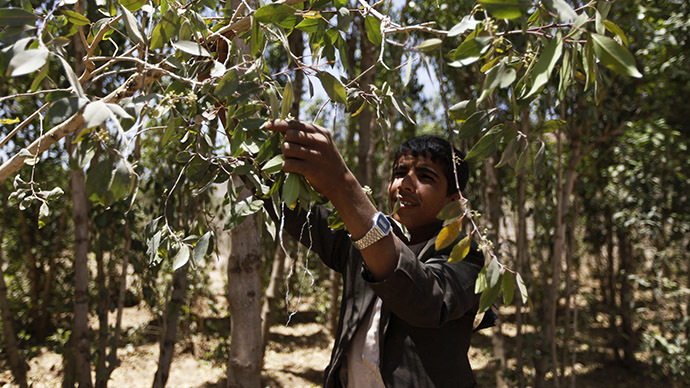 Al-Qaeda-linked forces are gaining greater control in eastern Yemen and are taking over policing control with a vigilante group of armed tribesmen issuing a decree banning qat, a popular mildly narcotic leaf enjoyed by locals. After Yemeni army units abandoned the port of Mukalla in the Hadramaut province earlier this month, the security vacuum in the east of the country has grown allowingAl-Qaeda to take responsibility for social policing including making arrests, Reuters reports. The ad hoc militia calls itself the “security directorate” and moved to ban qat on Wednesday. Social media showed pictures of the Islamist militants burning bales of it in Mukalla’s streets. “They have an Islamic court, people go to them to present complaints and they have patrol cars, but up til now they did not interfere in people’s affairs,” Salem Abdullah, a Mukulla resident told Reuters by telephone. The province’s ruling body, the Council of Islamic Scholars, brought Al-Qaeda into the local administration in order to avoid infighting and bloodshed. "We had no option but to reach an understanding with those elements, otherwise there would have been a confrontation that would have led to war, destruction and civilian casualties," a local official told Reuters on condition of anonymity. The civil war in Yemen has been raging for several months between the Iran-allied Shia Houthis and forces loyal to embattled President Abd Rabbuh Mansur Hadi, who is now living in exile in Saudi Arabia. A coalition of Sunni Muslim countries led by Saudi Arabia has launched air attacks on the Houthis but despite this the Shia rebels have made gains inmuch of the country and are advancing towards Hadramaut. The chaos and lawlessness in Yemen has led to the increase in power and influence of Al-Qaeda in the Arabian Peninsula (AQAR) - one of the terror network’s most active branches, which has been long active in Yemen and claimed responsibility for the attack on the Charlie Hebdo magazine in Paris in January that killed 12. But now Al-Qaeda dominance of the terrorist landscape in Yemen is under threat for the first time from the Islamic State (IS) terror group. Late last month a video emerged of around 20 men in a barren desert area of Yemen claiming to belong to IS who “declared a caliphate”. The group in the video calls itself the Soldiers of the Caliphate of Yemen and one of their aims is to push out AQAP, which has dominance in the south and south east of Yemen. In March IS also claimed responsibility for a series of deadly suicide attacks at two mosques in the Houthi-controlled capital Sanaa.